We will go through step by step hands-on scenario to build virtual appliance for SAP HANA on AWS in this hands-on. It includes how to install SAP HANA on AWS and we will go through the steps required to install and configure SAP HANA on AWS. I hope the information contained in this hands-on provide you basic idea about what AWS services are and how to configure SAP HANA on AWS environment. This post handles fourth part of the hands-on. We will try most steps in command line (awscli) but you should know that all tasks in this hands-on could be done on AWS console too. So far, we’ve created and configured EC2 instance. In SAP HANA’s point of view, EC2 instance will act as one Linux server. It’s the time to discuss the main topic, “SAP HANA installation”. In this post, we will handle the installation on the master only. We will utilize AWS S3 service for uploading/downloading SAP HANA installation image files. EC2 instance has been created and storage (file systems) has been configured. Next, we will install SAP HANA on EC2 Instance. You can follow the general steps for downloading SAP HANA installation images. SAPCAR needs to be downloaded in case SAP HANA installation image files are SAR compressed. SAPCAR is not necessary when those are RAR compressed because we already installed unrar. You can download SAPCAR from software download center (https://support.sap.com/en/my-support/software-downloads.html), Support Packages > Patches A – Z > Index S > SAPCAR. Once you download required files in your laptop, you can upload these files onto EC2 instance’s /media directory by winscp (scp in Linux). But, S3 service from AWS is useful and it shows quite good uploading /downloading performance when used with awscli. You can jump to “4.2. HANA installation – hdbldm” if you want to move installation image files via winscp (or scp) not via AWS S3 service. We will try to use AWS S3 service for uploading and downloading SAP HANA installation image files to/from S3 bucket. As the first step, you need to create S3 bucket for holding SAP HANA installation image files. In case you want to remove buckets, you can remove buckets with either of below commands. S3 bucket is created and you can upload SAP HANA installation image files onto the bucket, s3://mysaphanamedia. 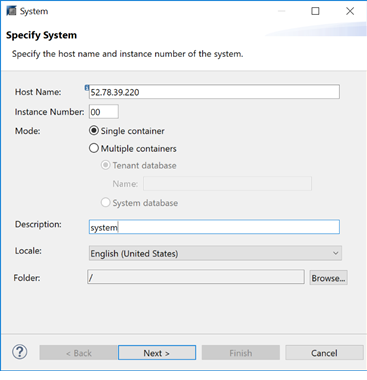 To do this in Windows, you need to follow below steps under the directory where SAP HANA installation image files are located (I assume all files were already downloaded from SAP software download center to your laptop). “aws configure” is required because it is the first time to connect to AWS services from your laptop. Access Key ID and Secret Access Key are the same as when you did “aws configure” in Linux. Once “aws configure” is done, you can synchronize your current directory on laptop to S3 bucket. This command will synchronize all files under the current directory (“./”) to S3 bucket, “s3://mysaphanamedia”. “aws s3 sync” command is for synchronizing the whole directory content to s3 bucket. If you want to upload files one by one, you can use “aws s3 cp”. You can list files on s3 bucket with “aws s3 ls” command. We will copy SAP HANA installation image files from S3 bucket to “/media” file system on EC2 instance. Run “aws configure” from your EC2 instance. This step is required because it’s the first time for EC2 instance to use S3 service as a client. You are on EC2 instance. Run “aws s3 sync” to synchronize all SAP HANA installation image files from S3 bucket onto your EC2 instance. If all steps go through without an issue, you will find all required files in “/media” directory. At last, you have all files required to install SAP HANA. From now on, you can go forward to installing SAP HANA. You can extract the compressed files with SAPCAR command (or unrar command in case those files are in RAR compression) and initiate HDBLCM (HANA Database Life Cycle Manager). It’s a normal SAP HANA installation. You can go forward single node installation. I assume you know well about SAP HANA installation, so I don’t explain the steps in detail in this hands-on. Once you successfully install SAP HANA, you need a couple of configurations on SAP HANA. It’s also possible to configure SAP HANA based on other best practices. Firstly, you need to edit two INI files, global.ini and daemon.ini. I recommend you to check below SNOTEs about parameter recommendation. I hope you note that the recommendations in SAP HANA configuration keep improving and above recommendations would change or new recommendations come. SAP HANA database has been created. You will connect to it from SAP HANA Studio. To make our consideration simple, we assumed that SAP HANA database server would be in public subnet. Therefore, no further considerations are required regarding NAT gateway configuration. When SAP HANA database server is in private subnet and you plan to isolate it from public access, further considerations are required, for example, NAT gateway and iptables (for port mapping, forwarding). With the public IP address (eg, 52.78.39.220), you can add new system in SAP HANA Studio. If “InstanceState” is “running” and both “InstanceStatus” and “SystemStatus” are “passed”. If HANA instance is started or not. This section handles post-installation actions. You need to follow below actions. 4.5.1. SAP HANA instance autostart setting. This step is required when you want to start SAP HANA instance automatically when EC2 instance starts. 4.5.2. Install AWS Data provider. For full support, we must enable built-in SAP monitors to retrieve information about configuration and resource utilization from the underlying AWS infrastructure. The Amazon Web Services (AWS) Data Provider for SAP is a tool that collects performance-related data from AWS services. It makes this data available to SAP applications to help monitor and improve the performance of business transactions. The AWS Data Provider for SAP uses operating system, network, and storage data that is most relevant to the operation of the SAP infrastructure. Refer to SNOTE 1656250 about SAP enhanced monitoring. We’ve installed SAP HANA on AWS for the master. What do you think installing SAP HANA for the worker for scale-out? It’s time to go to https://blogs.sap.com/2018/07/04/hands-on-configure-sap-hana-on-aws-part5/.